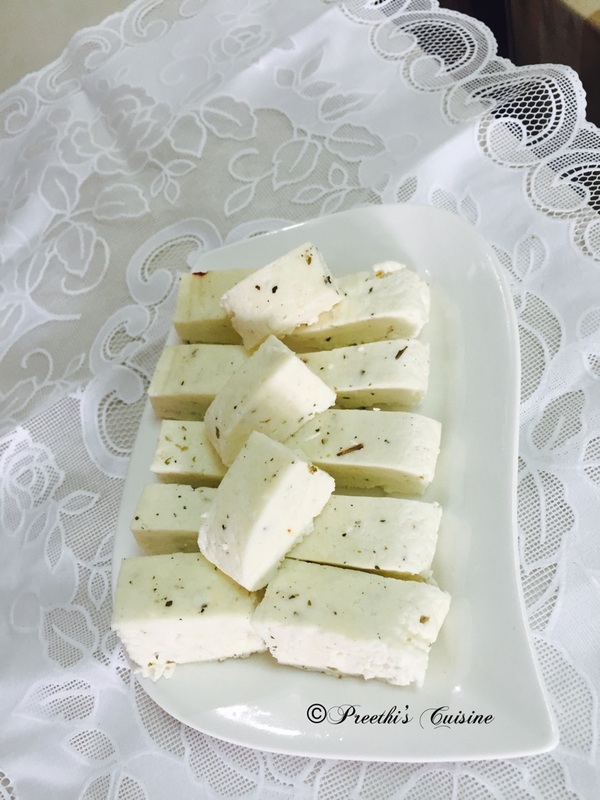 Paneer or White Cottage Cheese is very popular in Indian Cuisine. There are varieties of dishes that can be made using Paneer ranging from curries to sweets.Paneer is a rich source of Protein. Paneer can be store bought or homemade. There is nothing compared to homemade Paneer. 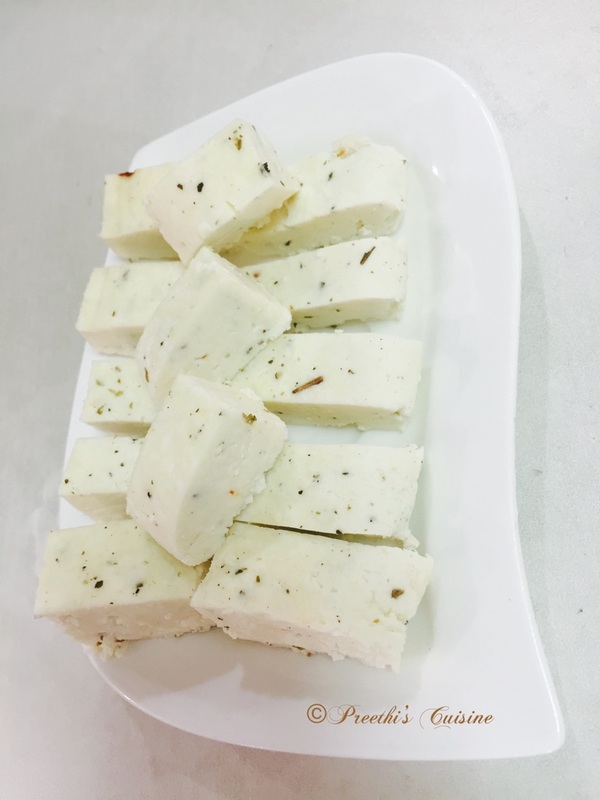 My Kids love Paneer and that is what motivated me to make Paneer at home. I have added some herbs and made Herbed Paneer. Heat the milk in a large saucepan over medium heat until it reaches a full boil. Lower the flame. Dilute the Citric acid in warm water till the granules are fully dissolved. Slowly stir in the citric acid. Continue to stir as large curds form and the whey becomes yellowish (approx 20-30 seconds). Remove saucepan from burner and let it sit undisturbed for 20 minutes, until the curds have settled to the bottom of the pan. Meanwhile, line a colander with a clean muslin cloth . Scoop the curds into the colander. Rinse them under cool running water for 15 to 20 seconds. Gather up the four corners of the muslin and hang the curds for about 30 minutes, until there is no more whey dripping from the curds or if you are in a hurry you can gently squeeze the bag of curds to remove excess whey. Open the muslin add pepper and Italian herbs and shape the curds into desired shape. Carefully fold the muslin back .Place the wrapped Paneer on a plate or tray that can collect whey. Put a heavy iron skillet or other heavy object on top of the wrapped Paneer for 30 to 40 minutes. Unwrap the herbed Paneer, cut it into pcs and store it in an airtight container in the refrigerator until ready to use. If refrigerated, it can stay fresh for 4-7 days.